We will doing the mount of this bad boy teener brown. 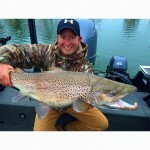 Craig Adkinson with his 8 LB.+ hookjaw brown from Irvine Lake. Good job man! 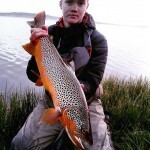 Jordan "Picasso" Whitten caught his best brown to date. This killer 9 LB. hookjaw was released. Congrats man! 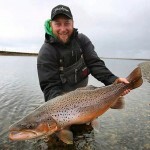 Spring and fall are the best times for Great Lake browns! Mike Squier with this beautiful 6 LB. 2 oz. hen from Tahoe. His personal best.....congrats man! Jim with a nice big brown and daughter Karyn. Nice hookjaw Mr. Bringhurst. Photo courtesy Greg Bringhurst. WOW! A killer sea-run hookjaw from South America! One of the most beautiful browns I have ever seen. It was caught somewhere in Europe. Jim with a nice brown and son Greg many moons ago. Another shot of Mike's 11.5 LB. hen brown. Way to go buddy! How about 2 browns over 20 LB. in one week!! Jim Bringhurst caught them from Flaming Gorge back in the 70's. Daughter Karyn looks on. 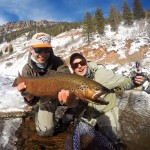 Jim with a Flaming Gorge brown beauty way over 10 LB.. Photo courtesy Greg Bringhurst. Jim holds up another 10 LB.+ brown. A New Zealand 8 LB. brown. Love the coloration and spotting on this nice hookjaw. Another Lake Michigan brown. Nice hookjaw! 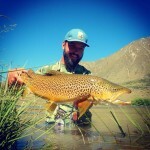 Braden Cluff with a fat hen brown. Photo courtesy Ken Cluff. Ryan Daniels nailed this nice 10 LB.+ buck recently for his first brown over 10! Congrats man! You have worked long and hard for this! Jerry McAllister with his 10 pound hookjaw from Crescent in early 2006.